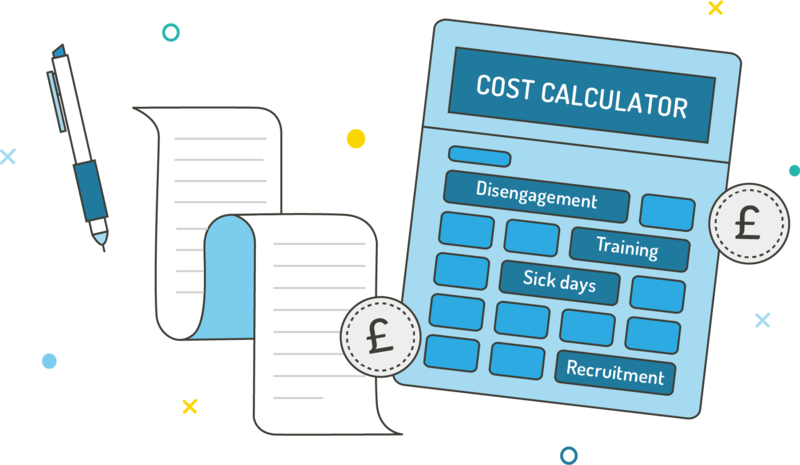 How much is employee disengagement costing your business? disengagement is setting you back by following these steps - it'll take about a minute. *The sliders are set to your industry average. Adjust them for a more personal result. *Reed, 'Average salary UK', 2017. *CIPD, 'Absence management 2016', 2016. & CIPD, 'The Health and well-being at work 2018', 2018. *Bersin & Associates, by Deloitte, cited in Growth Business 'Study reveals first year employment costs almost double salary', 2017. *Bersin & Associates, by Deloitte (2017), cited in Growth Business 'Study reveals first year employment costs almost double salary', 2017. *This number is based on the assumption that disengaged employees are more likely to take sick days and churn, leading to recruitment and training costs.